I was born at a time when the whole world lay in turmoil caused by World War 1. People suffered hunger and starvation. I came into a strict orthodox Jewish rabbinic and Chassidic home. Although my parents were poor at that time, they sent us boys to an expensive orthodox religious school. I had three brothers and a sister. My father's only desire was to make rabbis of us four boys. At five I was already going to cheder for first grade pupils and when seven I was able to read Hebrew. At nine I was introduced to the Five Books of Moses and the Bible commentator "Rashi," and also to the ancient now obsolete Jewish books of jurisprudence called "Talmud." When I was 10 11 years old, the Talmud eclipsed all the other books and became the main textbook for the next 10 years of my life. At thirteen I started my independent religious life. I was told that we children are under our father's jurisdiction until thirteen; at that age we become free from our father's supervision; we alone are responsible for our sins. Therefore, after I became thirteen I was taken to a synagogue where my father thanked God that he had got rid of my sins. The home of my parents was very strict Orthodox. My father was a rabbi. He went to the synagogue to pray three times a day. We observed the Jewish laws according to the Talmud, for our parents desired that their children, too, should follow in their father's footsteps and remain strict Orthodox Jews. 1. Clothing Jews wore long black coats called "Kaftan" and a black hat called "Yiddishe Hutel." The Polish people wore European clothing. It was considered a great sin for a Jew to wear European clothing. 2. Language Jews spoke Yiddish while the Poles spoke Polish. Yiddish is a Germanic language mixed with Hebrew and Slavic words. 3. Religion Jews worshipped in the synagogues which were also used as places of social gathering and Bible and Talmudic study classes. Polish people were almost 100% Catholic. Poles were mainly farmers and government employees. The Jews were not granted the privilege of working for the municipal and federal government, nor in factories or agriculture. There were a thousand other differences between the Jews and the Poles differences in customs, way of life, behavior, temperament, and outlook. Their interests, hopes and wishes were also different. It is hard to put into words the things that separated us. When I was six years old I tried to go for a walk outside the Jewish "Ghetto." Suddenly a Gentile boy threw a stone at me while shouting: "Jew, Jew!" I, as a child, did not know that a Jew is hated by non Jews. Therefore I was surprised and scared. I ran back home to mother and told her that a boy threw a stone at me, calling me "Jew, Jew!" "Why is the boy throwing stones at me? Why is he calling me ‘Jew?' I never saw this boy before. Why does he hate me whom he had never seen before?" "He is a Christian and Christians are Jew haters. Even if he does not know you, he is your enemy." "But why is he my enemy?" I kept on asking. "He believes what he is being taught. His priest, his teacher, his parents tell him to hate the Jews. Therefore he hates you even without a cause. But when our Messiah comes, we shall be the head and not the tail. Then we will go back to Palestine and no one will persecute us any more." "But when will the Messiah come?" I kept on asking. "We don't know the exact time, but He will come some day. Then our sufferings at the hands of the Christians will come to an end." The hope of the coming of the Messiah accompanied me all my life. It gave me power to endure suffering and humiliation from my Gentile neighbors. After my "Bar Mitzvah" I was sent to a higher rabbinical school with the sole purpose of becoming a rabbi. I spent the years from 13 to 22 in different schools where the main subject was the Talmud, which consists of 60 books dealing with everyday life. The main problems with which they deal are: damages, Holidays, marriage and divorce, prayer and farming problems. The main style of the books is "the argument." For example, one rabbi said that if an egg is laid on a Holiday, it is kosher to eat, and the other rabbi said that the egg is not kosher, but "trefa." The Talmud is a work of arguments and scholastic pilpulistic sayings. It deals also with mysticism, metaphysics and folklore. I, as a student of the Talmud, had to know by heart the name of every rabbi who expressed his opinion in the matters of damage, Holidays, etc. The Talmud was written in the time of the Tannaim and Amoraim, 1800 years ago. Since then thousands of books of comments on the Talmud have been written. The most famous 'books, which are as important and binding to the Talmudists as the Talmud itself, are: The Rambam, the "Rosh," The Tosafot, and Rashi, who is the greatest Talmudic commentator. I had to know all these different opinions and sayings. Since there were so many to study, we did not have time for even the most elementary secular subjects. I was ignorant in matters of arithmetic, geography, etc., but at the age of twenty two I was considered a "lamdan" which means a man who is learned in the Talmud. On September l ,1939, World War 11 broke out. I had just received my rabbinical diploma called "Smicha" that past summer. I planned to marry and to become a religious leader of Israel, and to use my acquired knowledge to lead my fellow Jews in the ways of the Talmudic, rabbinic traditions. During six years of such anti Jewish activities, 6 million Jews, among them one million children, lost their lives. One third of the world's Jewish population was annihilated. The fields of Europe are still wet with the innocent blood that was shed. Yes, here and there a conscientious Polish family rescued a Jew, hiding him and feeding him, but the number of these good people was very small. After the war I came out of the concentration camp with the hope of seeing and being united with my relatives. I put advertisements in newspapers. I went to different institutions to find out about my relatives. To my great sorrow I learned that all my loved ones had perished with the six million Jews who were victims of the greatest demon in the history of mankind Nazi Ideology. I came to realize the bitter fact that I was alone in the world without a friend, not belonging to anybody, nobody belonging to me. I could hardly believe that I would never see my parents, my sister, my brothers or my uncles again. I was now in a strange world, in a world without a friend and without a relative. I started to look for a human friend, but no one could satisfy my longing for a true mother heart or father love. Nobody could substitute the love of a sister, the faithfulness of a brother. I was disappointed and desperate: I lifted my eyes up to heaven and asked the old Jewish question: Why? Why was one third of the nation of God put to death by the Nazis? Where was God when a little innocent Jewish child cried for help when the Nazi murderers raised their brutal hands to kill it? Why was God silent in these terrible times for His chosen people? Since I had no one in Poland. I decided to go to America: I thought that perhaps in a new land I would forget the dreadful past and start a new life. In order to go to America I had to go first to Germany where the American Army occupied the Western German territory. I became a member of a Zionist group whose sole work was to take the Jews out of Poland and bring them to Germany and Italy in order to enable them to emigrate to Israel or America. Although I worked in the capacity of a Talmudic teacher in the synagogue, there was a great conflict in my heart. The question: "Why did God allow 6 million Jews to die?" bothered me. I taught things that I was not sure were true. I told my congregation and students: "If we Jews want to exist and to overcome our enemies we have to keep the Sabbath day holy." In my heart I knew that 99% of the Hitler victims had kept the Sabbath day holy, yet it did not protect them from being killed. I did not have any proof or assurance that what I taught was true. I also lost my belief in the Talmudic legends, laws, and arguments pro and con. I was looking for the truth, but could not find it. Each Holiday we Jews go to the synagogue and pray to God, confessing our sins, and asking for forgiveness. We say, "Because of our sins we were driven from our land." Confession of sins is a very important part of our prayers. The Jewish prayer book cites different kinds of sins which a Jew must confess in his daily prayers. The most solemn day of prayer is Yom Kippur, and on Yom Kippur Eve, every Jew over 13 years of age must recite 45 confessions called "Al Chets." After the confession, the "Slach Lanu" (Forgive Us) is chanted by the congregation. When I prayed these prayers I felt unhappy and dissatisfied because I knew that according to the Bible, confession alone does not forgive sin. I knew that in order for sin to be forgiven, a sacrifice called "korban" must be offered. Leviticus deals with the "korban" many times, especially Lev.5:17 19. I felt very unhappy with my spiritual state of mind. I lost faith in mankind and in the rabbinical legends and teachings. I felt miserable knowing that I, as a rabbi, was teaching the people things that I did not believe. I knew that the Talmudic teachings, sayings, pilpulistic arguments, scholastic debates, hair splitting comments about obsolete damages, laws, rules and regulations regarding Sabbath, Holidays, clothing and washings, are of very little significance to us. I realized that we need some real solid spiritual truth by which to live, walk and exist as Jews. What is the truth? What is the true way for us and for me individually? I did not know! I looked on my people as on sheep without a shepherd. I saw that 2 000 years of Talmudic, Chassidic, Kabbalistic and worldly teachings could not save one Jewish child from destruction. I knew that we Jews suffer for our sin, as we read in our prayers on the Holidays, but I did not know what our sin is. First Contact With Light. One spring evening I walked somewhere in Rhode Island. I looked here and there without a goal, just breathing in some fresh spring air. While I strolled, I noticed some young people standing near a store handing out little printed papers. They caught my attention and handed me a pamphlet too. As I could not read English I decided to go into the store to find out what kind of sale they were having. When I came inside I was surprised to see that there was no merchandise. To my astonishment, I noticed every one sitting with eyes closed and head bowed. "What is going on here?" I thought. I did not know that this is the manner in which Christians pray. It was in contrast to the way Jews pray with eyes open and shaking on all sides. I waited a while till everybody had finished praying and opened their eyes. A boy came and talked to me, but I did not understand him. I had been in the United States only a few weeks and did not know the English language. Finally I said that I speak only German and Yiddish. Through the use of sign language I made a date to come back the next Wednesday, when a German speaking person would come and explain to me what the organization was. The next Wednesday the German gentleman was waiting for me when I came. He shook my hand in a friendly manner and said to me in German: "This is a mission to the Jews." "What is a mission?" I asked. "The Lord sent us to the Jews to let them know that God loves them and wants them to be saved." "What do you mean saved? How can you speak about love after the cataclysm that came over the European Jew?" I asked. He smiled and said, "I know how you feel; but Christians, followers of Christ, love the Jews, and all those who harm them are not Christians. The Alpha and Omega of Christianity is love to mankind, Israel included. The Lord told us to go to the Jews first." "Weren't all those who carried crosses and had pictures of saints in their homes yet organized pogroms against the Jews of Europe weren't they Christians? Weren't the churches in Poland and Ukraine the main source of anti-Semitism? Didn't the priests incite their people against the Jews?" He looked at me and said. "The Lord teaches us to love our enemies, to show love to those who hate us. All those who do not obey the teachings of the Lord are not His followers." Then he gave me a Yiddish New Testament and said, "Read it and you will find the true teaching of Christ." I took the New Testament, put it into my pocket and said, "Yes, sir, I will read it. I want to see what the New Testament is really like. I don't know anything at all about it." In the next few nights I had much to read. Every line, each page, was a great revelation to me as I read with great interest. Opening the Book of Matthew, I was surprised to read that Jesus is of the lineage of Abraham and David. I also noticed that on every page it says "As it is written," which means that it was written in our Jewish Bible. For example, in the first chapter I read that He will be born of a virgin because it is written: "Behold a virgin shall be with child and shall bring forth a son and they shall call his name Immanuel..." (Isaiah 7:14). "Thou Bethlehem in the land of Judah are not the least among the princes of Judah, for out of thee shall come forth a governor that shall rule my people Israel" (Micah S:2). Also I saw that He shall come out of Egypt, for it is written: "Out of Egypt have I called my son." (Hosea 11:1) Thus reading I noticed on each page and in every chapter constant references to the Old Testament. It became clear to me that this book called New Testament is actually the fulfillment of the Old Testament. I realized that we rabbis were too much occupied with the Talmud and paid little or no attention to our Holy Bible. Then and there I became a Bible believing Jew. I thanked God for leading me to that little mission and decided to dedicate my life to Messiah. It was a few weeks before Passover. The missionary in Rhode Island gave me the address of a Jewish believer in Jesus who lived in New York, and I went there because I had never before seen a Jewish believer in Jesus. ' As soon as I contacted him, he invited me to his home. He welcomed me with the greeting, "Shalom Aleichem." We read together from the New Testament in Yiddish. After a while he told me he had written a poem called "The Sufferer," and started to read it. But this was only a pretence, as it was in reality the 53rd chapter of Isaiah. Then he asked me, "Who is the subject of this poem? Who suffered for our sins? By Whose stripes are we healed?" I answered, "It probably refers to Jesus Christ." Then he said; "I just copied out and read to you the 53rd chapter of Isaiah. 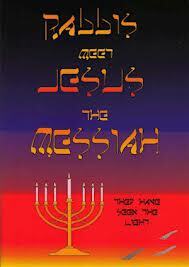 He was the one who wrote about the Messiah." Imagine my surprise and shock. I did not know the contents of Isaiah 53! The next day I showed the same "poem" to a friend, a rabbi in New York. He did not know either that Isaiah had written the chapter. The only conclusion I could reach was that the main reason so many rabbis and other Jews don't know the Messiah, the Saviour of the Old and New Testament, is that they don't know the Bible. I decided to do everything in my power to bring the Jewish Bible to them. The same evening I came to the New York missionary and told him that I believe in the Bible and in the Lord Jesus. Then and there we knelt and prayed for sin forgiveness and for salvation. I accepted Jesus as my personal Saviour. What a change came over me! I was very happy. I felt a peace, joy and happiness that I had never known before. My whole being turned into a happy life. I was a new creature. God Forgives Sin. When l came home I took the Bible and read the 53rd chapter of Isaiah over and over again. As I read I wondered why I had not heard of Isaiah 53 before. Why didn't the rabbis tell me of this chapter? It was obvious to me that we Jews could not be considered Bible believers if we deny Isaiah 53. As I read more, it became clear to me that Isaiah's prophecy in chapter 53 expresses God's glorious plan of forgiveness, reconciliation with God and salvation. I went to Los Angeles and started my American education in the second grade of elementary school. After finishing 8 grades I graduated from high school. Later I went to Los Angeles City College, and finally to Biola College, where I received a B.A. degree. I was baptized, and ordained a minister of the Gospel. Now my deepest interest is to bring the Gospel to my people, the Jews, that they, too, may accept their Messiah and inherit eternal life. Messiah said, "I am the way, the truth and the life, no man cometh unto the Father except by me" (John 14:6). After I was saved I felt that it is not enough that I know the Light, but had the desire that all the Jewish people should believe in the Messiah of Israel. I saw that this would not be easy. The ones who do not believe, bitterly oppose the preaching of the glorious Gospel to my brethren in the flesh. I knew their prejudice against the Gospel and their worldly views of life. Yet, knowing that the struggle would not be easy, I decided to go on with the work of God. I became more and more interested in spreading the truth among the innocent Jews who were being misled by their "shepherds." They were blind leaders of the blind who were interested in their own welfare, but cared little for the people. God called me to His service and I was sure that He would protect me and help me to spread the light among those who never heard the true story of Christ. A great force from within pushed me to do the work and this great force was the Holy Spirit Himself. This power of the Holy Spirit told me day and night, "Feed my sheep." And I answered, "Here I am . I am willing to go to the House of Israel whom the Father loves so much, and to tell them the simple but sure plan of His salvation." I saw tired and unhappy Jews who were groping in darkness, looking for the truth, and there was nobody to help them. Therefore I was the more determined to go and proclaim the Gospel to the weary and heartbroken ones. Jesus said: "Come unto me, all ye that labour and are heavy laden, and I will give you rest." Copyright. For further information regarding this testimony write to: Hebrew Witness, Inc., P.O.Box 132, Brooklyn, N.Y. 11229, U.S.A.